Supported networking Ethernet, IPv4, IPv6, TCP, UDP, DNS. These days any website or a server name on the Internet is resolved via DNS (Domain Name System). DNS translates textual names into IP addresses that are used by computers to communicate within each other. DNS Proxywall filters and blocks textual names according to the rules. It also acts as a DNS Proxy (when enabled). DNS cache that accelerates web browsing by resolving names instantaneously. Editing of DNS records allows to specify your own IP addresses for DNS names. DNS monitoring allows to see in real-time domain names being resolved as well as the countries of their location. It also allows (on wired networks) to see which DNS names are resolved by other computers on the same network. The log can be viewed and stored into a file for later analysis. Flexible viewing of captured DNS activity allows to quickly locate the events (blocked, resolved via server, resolved via cache, etc.) for viewing. It filters out the noise and brings only important events right at your eyes with a click of a button. DNS performance measurement allows to measure roundtrips of DNS packets during the name resolution to get an idea of how fast DNS names are being resolved. Multiple performance metrics allow to make analytical decisions about the upstream DNS servers and about the currently connected proxy clients. DNS Proxy allows other computers to connect in to use its cache or to use its DNS forwarding capabilities. There are several modes of operation supported: standard DNS and DNS tunnel (when DNS traffic goes inside of the TCP traffic). These modes can even work concurrently. DNS Proxy also supports TCP tunneling inside the encrypted SSL/TLS traffic. Cascading of multiple DNS Proxywall servers alows to organize them into a chain. Such a chain can consolidate standard DNS traffic into a TCP tunnel on one end, forward to wherever is needed, then extract the standard DNS traffic from it on the other end and forward it to any other standard DNS server. Juggle your DNS traffic whichever way you want. Authentication between DNS Proxywall and DNS clients uses self-signed certificates. There is no need to pay for certificates, just generate a certificate (within the program) and provide its signature to the other side. So the two sides of communication (DNS Proxy server and DNS Proxy client) can recognize each other. The access to DNS Proxy capabilities can also be restricted by specifying the exact IP address and subnets of allowed DNS clients. Load balancing allows to manually select the algorithm of forwarding DNS packets to multiple DNS servers. The internal IP Firewall allows to block not resolved via DNS addresses. It adds a solid layer of security that protects from malicious code that is trying to circumvent standard communication pathways. 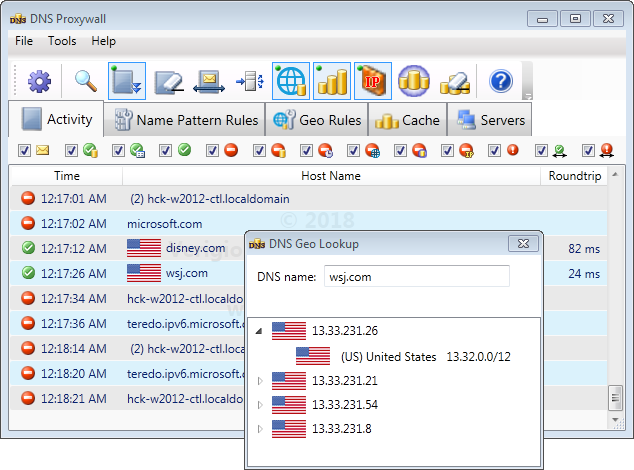 Geo tools allow to quickly identify which country/territory server addresses belong to. - DNS query was sent the response was not yet received. - DNS request was successfully resolved via local DNS cache. - DNS request was successfully resolved via internal table of permanent host addresses. - DNS request was successfully resolved by DNS server. - DNS request was blocked by name pattern rules. - DNS request was blocked due to cached response from DNS server contained name resolution refusal. - DNS request was blocked due to expiration (exceeded expiration threshold). - DNS request was blocked due to geography. - DNS request was blocked due to DNS cache only mode and the name was not in the cache. - non-DNS (direct address) connectivity was blocked by IP firewall since the IP address does not have matching record wihtin the cache. - DNS request was refused by the server (the DNS server was unable to resolve the name). - DNS request was picked up in promiscuous monitoring mode and was resolved by DNS server for some other computer. - DNS request was picked up in promiscuous monitoring mode and indicates it the failure to resolve the name was communicated between two other computers.